Atal Bihari Vajpayee passed away today at the age of 93. Leaders cutting across the political spectrum mourned the loss of India’s former prime minister. The 93-year-old political icon was suffering from kidney tract infection, urinary tract infection and even respiratory problems. In 2009, he suffered a stroke leading to loss of speech and subsequently causing dementia. Vajpayee was a monumental figure in both BJP and India’s political landscape. He was the first non-Congress Prime Minister to complete his five-year term. 9:35 pm: PM Modi paid his homage to his mentor Atal Bihari Vajpayee at the latter’s residence. Also to pay their respects were party chief Amit Shah and Vajpayee’s contemporary LK Advani. 9:30 pm: Union Home Minister Rajnath Singh and Foreign Minister Sushma Swaraj reached 6, Krishna Menon Marg to pay their respects to Atal Bihari Vajpayee. Rajnath Singh will also hold a condolence meeting for Vajyapee in Lucknow on August 21. Vajpayee was elected from Lucknow multiple times and after that, Rajnath Singh became the MP from the city. 8:40 pm: Former prime minister Manmohan Singh has written a letter of condolence to Atal Bihari Vajpayee’s adopted daughter Namita Bhattacharya. 8:35 pm: “All of us who knew Mr. Atal Bihari Vajpayee are saddened to hear of his passing away. He was a great leader with a great sense of compassion and humour. He will be remembered fondly by a vast number of us,” said Tata Trusts Chairman Ratan Tata. 8:30 pm: A half-day holiday has been declared in the afternoon for all Central government offices and CPSUs across the country and Delhi government offices. 8:20 pm: The mortal remains of former PM Atal Bihari Vajpayee have been brought to his home at Krishna Menon Marg. 8:00 pm: Remembering the former prime minister, Sunil Bharti Mittal, founder and chairman of Bharti Enterprises called Atal Bihari Vajpayee the Father of Modern Telecommunication in India. “A great economic reformer, as a Prime Minister he was always guided by a strong conviction that liberalisation would help us realise our economic potential and ultimately open the doors to becoming a globally competitive, strong and resilient economy. He can truly be called the Father of Modern Telecommunication in India having ushered in the National Telecom Policy in 1999, which helped the industry overcome some of its toughest early challenges,” Mittal said. 7:50 pm: Bihar Government has declared seven-day state mourning and a public holiday tomorrow. 7:45 pm: Delhi government declares holiday tomorrow as mark of respect towards the former prime minister. All schools and colleges in the national capital will remain shut. 7:30 pm: “An era comes to an end with the passing away of Atal Bihari Vajpayee. The nation has lost not just a Bharat Ratna, a statesman par excellence, but also an admirable human being. His gift with words, his decency and grace in dealing with friends and foes were the mark of an exemplary life in politics. His warmth and soft-spoken charming manner ensured he was loved by all whose lives he touched. He put the nation on the fast track with initiatives like the Golden Quadrilateral project, the New Telecom Policy, the Sarva Siksha Abhiyan and the Fiscal Responsibility Act that laid down the path for future governments to follow,” said Dr Prathap Reddy, Founder & Chairman, Apollo Hospitals. 6:55 pm: Government announces 7-day state mourning throughout India from August 16 to August 22. Flags will be flown half mast and no official entertainment will be allowed. 6:40 pm: Vajpayee’s last rites will be conducted near Smriti Sthal on the banks of Yamuna. The memorial is the designated spot for the cremation of presidents, vice-presidents and prime ministers. 6:30 pm: Atal Bihari Vajpayee’s body will be taken to his residence at 6, Krishna Menon Marg, where it will be kept throughout the night. The body will be taken to the BJP headquarters at Ashoka Road to allow the public to pay their respects. 6:00 pm: “It was Atal Ji’s exemplary leadership that set the foundations for a strong, prosperous and inclusive India in the 21st century. His futuristic policies across various sectors touched the lives of each and every citizen of India. It was due to the perseverance and struggles of Atal Ji that the BJP was built brick by brick. He travelled across the length and breadth of India to spread the BJP’s message, which led to the BJP becoming a strong force in our national polity and in several states,” PM Modi said. 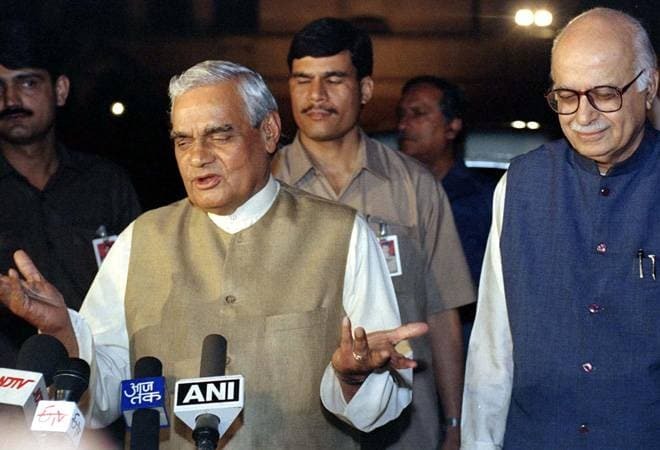 5:45 pm: Atal Bihari Vajpayee passes away. 2:10 pm: PM Modi arrives at AIIMS. His second visit in 24 hours, PM Modi has reached AIIMS to check on Atal Bihari Vajpayee. 1:50 pm: West Bengal CM Mamata Banerjee will board a 2.50 pm flight to Delhi to see Atal Bihari Vajpayee. 1:45 pm: Rajasthan CM Vasundhara Raje and Lok Sabha Speaker Sumitra Mahajan have reached AIIMS. 1:44 pm: Former Samajwadi Party leader Amar Singh has also reached AIIMS to enquire about Atal Bihari Vajpayee’s health. 1:43 pm: BJP chief Amit Shah reaches AIIMS again after his visit in the morning. 12:40 pm: UP CM Yogi Adityanath is also expected to arrive in Delhi to visit Vajpayee in the hospital. Bihar CM Nitish Kumar is also expected. 12:35 pm: Delhi police has urged people to avoid taking the Aurobindo Marg to avoid traffic as AIIMS is situated near Aurobindo Marg. 12:30 pm: Delhi Chief Minister Arvind Kejriwal and Deputy Chief Minister Manish Sisodia have also reached AIIIMS to meet Vajpayee. 12:15 pm: Politicians are lining up at AIIMs to meet the former prime minister. Jammu and Kashmir chief minister Farooq Abdullah visited Vajpayee. “His condition is grim, just pray for him,” Abdullah said. 11:00 am: AIIMS released a press statement saying Vajpayee’s condition “continues to be the same”. He is critical and is on life support systems, it said. 10: 50 am: Earlier this morning, Vice President M Venkaiah Naidu was also seen leaving the premises of the hospital. Various BJP leaders are visiting the hospital to take stock of the former PM’s health.